Do you want to save time and money and help bring more profit to your bike shop? Tired of wasting hours on changing wheels by hand? At Best Buy Auto Equipment, we offer a wide motorcycle tire changer selection, so that you can make your job as quick and simple as possible. The NW 400 was designed specifically for motorcycle repair shops. Equipped with our unique motorcycle wheel clamps and a powerful square turntable to take the hassle out of wheel repairs. Outside Clamping Range: 6" - 24"
The New Plus one has 3 different stages to adjust the jaw clamps. This tire machine delivers true performance, unparalleled control, and increased efficiency. The Talyn Plus 1 wheel-clamping and bead-breaking operations are precise, assuring expensive alloy wheels are undamaged. Wheel width: 3" - 12"
The NW 530 is a great machine for a small shop on a tight budget. All the features you demand at a price you can afford. To use for Motorcycles or ATV's you will need to purchase either Motorcycle / ATV Adapters. The NW 950 has power to spare and a 26” x 26” square turntable that can handle wheel diameters up to 47” with ease. To use for Motorcycles or ATV's you will need to purchase either Motorcycle / ATV Adapters. Wheel width: 3" - 15"
This model has power to spare and a 26” x 26” square turntable that can handle wheel diameters up to 47” with ease. To use for Motorcycles or ATV's you will need to purchase either Motorcycle / ATV Adapters. Wheel width: 3” - 15"
The Hofmann monty 1270 swing-arm tire changer with small footprint and 20" outside clamping capability. Inner-Wheel Clamping Diameter: 12" – 22"
Outer-Wheel Clamping Diameter: 10" – 20"
CEMB's high volume motorcycle tire changer for motorcycle dealers looking to change motorcycle, ATV and scooter wheels. Outside Clamping: 6" - 24"
The NW 1300 protects your expensive rims with out new economical leverless tire changer! The Hofmann monty 1520 is an entry-level tire changer designed for single-bay repair shops and quick-lubes. Inner-Wheel Clamping Diameter: 10" – 20"
Overall-Wheel Clamping Diameter: 12" – 20"
The New K&L MC900 is the ultimate machine designed to handle even the toughest motorcycle, automotive, ATV, UTV and trailer tires. The Power Assist arm is equipped with a roller arm, pressing foot and lifting disk to aid in easily mounting and demounting tires. Automotive Wheel Diameter (Outside Clamping): 10” - 20"
The Hofmann monty 1520m and 1520emx are designed to change all types of motorcycle and ATV tires, including tires on difficult Harley Davidson belt drive wheels. The clamping jaws are designed to eliminate additional labor involved in removing the brake disc, sprocket, or drive pulley when servicing a wheel. Overall Wheel Clamping Diameter: 10" – 21"
Bead Breaker Range: 0" – 12"
External Rim Diameter: 6" – 24"
Internal Rim Diameter: 10" – 27"
The new MC900 Deluxe Tire Machine with the Leverless Tower is the ultimate Tire Machine for even the toughest Motorcycle, Automotive, ATV, UTV and Trailer tires. The Leverless Tower eliminates traditional tire tools that can mar the surface due to tough tire applications and operator error. The Hofmann® monty® 1620 is designed for high-volume tire shops, multi-bay repair shops and car dealerships. The SM900+PA comes with a low profile press arm. Swing arm tire changer for motorcycles and ATV’s, dual clamping cylinders, inserts protect aluminum wheels, pressarm and the bead breaker is designed for motorcycle and ATV’s wheels. The Coats RC Series Rim Clamp tire changers are built upon the high standards of the legendary Coats Rim Clamp tire changer. The RC Robo-Arm keeps the top bead in the drop center during mounting, allowing technicians to change difficult wheels with ease. Hofmann monty™ 1520EMX Motorcycle/ATV Tire Changer w/"EasyMont"
Hofmann monty™ 1520EMX Motorcycle/ ATV Tire Changer w/"EasyMont Pro"
Max. 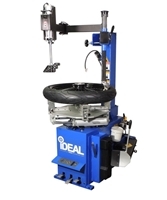 Outer Tire Diameter: 40"
Inner-Wheel Clamping Diameter: 12" – 26"
Outer-Wheel Clamping Diameter: 10" – 24"
The COATS® RC-150 tire changer features motorcycle rim clamps that provide extra clearance for sprockets and your choice of three optimized positions. The RC-150 can clamp rims up to 23" and they work just as well for smaller ATV rims down to 6" so you can handle virtually any wheel that rolls in. 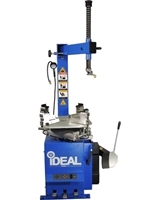 The Coats 60X Rim Clamp tire changers are built for high volume shops. The 60X includes advanced features and a best-in-class external clamping range. Internal Rim Diameter: 6" – 24"
The COATS® RC-200/EX tire changer features newly designed motorcycle rim clamps that provide extra clearance for sprockets and your choice of three optimized positions. The RC-200/EX can clamp rims up to 23" and they work just as well for smaller ATV rims down to 6" so you can handle virtually any wheel that rolls in. From Nationwide to AMMCO, we bring you brands that are reliable and have a trusted reputation in the industry.You don’t have to sift through our collection to find a top-quality item because all of the products we carry are carefully crafted and built to last. We provide great product descriptions to help you narrow your choices down, but if you are still not sure about which option you need, feel free to contact us. We’ve been in business since 1987 for a reason. We love to make sure that all of our customers find exactly what they need and are completely satisfied with their purchases.